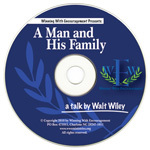 For orders outside the USA, call +1-704-543-1997 or email products@wweministries.org..
"A Man and His Family"
Walt talks about priorities and the challenge of fitting the family in. 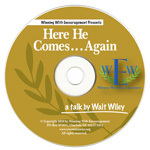 "Here He Comes ... Again"
A practical look at Christ's return. When will it be? How will it happen? 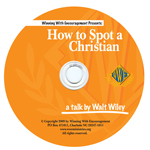 "How to Spot a Christian"
Walt believes that when you say you are a Christian that means 2 things. "What Robs Us of Our Passion?" Walt talks about an obstacle you may be wrestling with that might be preventing you from doing what you really wish you were doing. "What It Means to Be a Steward"
Walt thinks we have taken a wonderful privilege God gave us called prayer and unfortunately have made it more complicated than it should be. 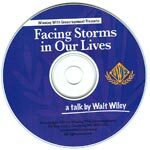 "Facing Storms in Our Lives "
Here Walt shares 3 very practical things to think about when you feel you are about to sink. 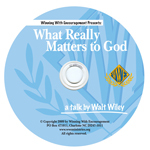 "What Really Matters to God"
Want to be encouraged? You will be when Walt reminds you of what God views as important. 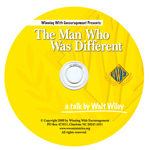 "The Man Who Was Different"
We are not suppose to be like everyone else. Walt points out a Bible character you probably never heard of who was singled out for being different.